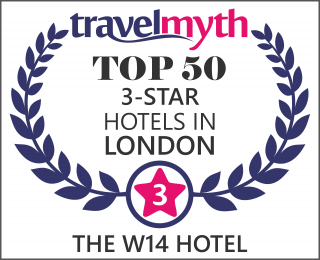 The W14 Hotel London is a 3 Star Hotel located in trendy Kensington, London. The hotel spans four beautiful Victorian town houses with original features and has been given a clean, contemporary look. Situated in a quiet, leafy, residential road close to the prestigious shops of High Street Kensington, the W14 Hotel London is just a 10 minute underground ride from the sights and sounds of Central London. You can view the W14 Hotel London on our interactive map. Please also read the W14 Hotel London Reviews. Tastefully furnished stylish ensuite bedrooms, fully equipped with all the amenities making them an ideal choice for leisure and business travellers. The hotel is newly refurbished, finished in December 2014, and it has had rave reviews from guests and industry professionals. Our staff are amazing! They will go out of their way to help you with whatever they can, and they are on hand 24 hours a day. The complimentary Continental breakfast on offer. We have a selection of breads with a choice of jam, marmalade, chilled juices, cereals, hot chocolate, milk, coffee and tea.Click here for the full selection. Eco friendly hotel with energy saving light bulbs throughout the Hotel, energy saving climate control as it is only operational when key card is inserted, eco friendly roof on the breakfast room which conserves heat yet provides a natural environment for birds and insects. Together we do our bit for the environment without actually ‘doing’ anything! The W14 Hotel London has an extensive choice of budget hotel rooms, ranging from Single, Double to Triple private en-suite rooms including free continental breakfast and Wi-Fi Stay at our hotel offers unbeatable value and facilities whether you are travelling with family, as a group or alone. Each hotel room has its own security locker, high quality beds and electronic touch card access making them comfortable, modern and secure. Safe, and comfortable cheap accommodation in London, the quiet Hotel Bar is also an important part of this highly recommended budget hotel. The W14 Hotel provides a wide range of bedrooms with the price starting from £59 per room per night for a Single En-Suite Room with WiFi and Breakfast. We also provide short term secure luggage storage in Hammersmith in association with Repono.Store. This was the nicest hostel I have ever stayed in. It was spotlessly clean throughout, the staff were all friendly, courteous, efficient and genuinely made me feel welcome and that my business mattered to them. The facilities were amazing, from free WI-Fi to a delightful outdoor area, nice bar area with high quality value meals. Good modern security system with cards rather than keys. I think proprietors from all the other budget accommodation in London should check in as guests in their own establishments for a few days and then spend a night at W14 to see how it should be done.